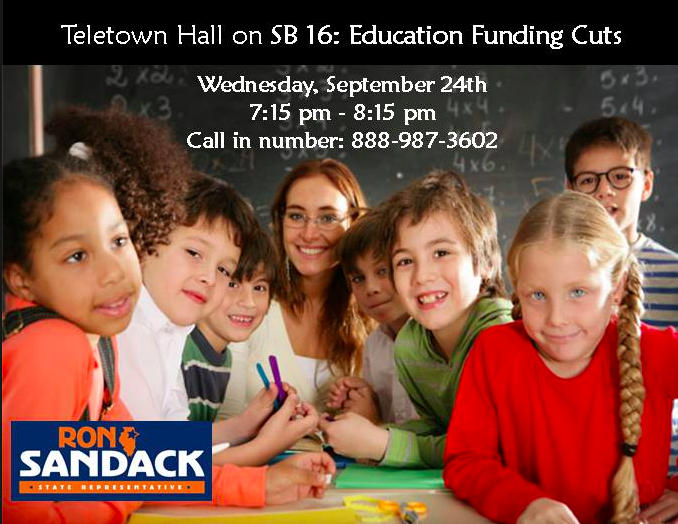 Those of you who live in and around the suburbs and have school-aged kids have probably heard murmurs and whispers about something called "Senate Bill 16". Senate Bill 16 would significantly rewrite the school funding formula in a manner that would devastate schools in much of the suburbs of Chicago. State Representative Ron Sandack has taken on the bill and is working to actively 'sink' it (as the Illinois Observer put it) and that's good news for those of you who live in DuPage, Will, Kendall, Lake Counties. SB16 passed in the Illinois Senate during the final days of the Spring legislative session but was not called for a vote in the House of Representatives. It is possible that a revised version of the bill will emerge during the General Assembly’s November veto session. And...State Representative Ron Sandack isn't doing this alone. He wants you - the voter - to get involved. That's why he's hosting a Tele-town Hall meeting TONIGHT from 7:15 to 8:15 on SB 16. You can join by calling 888-987-3602 at 7:15 or email him at Ron4Illinois@gmail.com with questions ahead of time.